Kate Martin. Editor for U.S. Water Works, a trade magazine you’ve never heard of. Happily married to Joe, a man who looks good in his package delivery uniform. Mother to three furry dogs. A nice, uneventful, simple life. Everything like clockwork, until her period was not. Not only is the pregnancy unexpected, but her employer is restructuring various positions, which means Kate may find herself without a job. Knocked up and laid off? Could this get any worse? 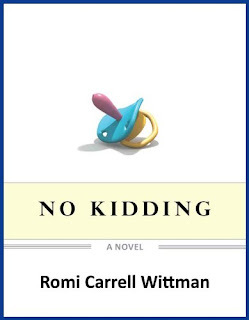 Romi Carrell Wittman’s novel about a potentially downtrodden mother-to-be was a hysterical read! I know, that sounds like an oxymoron of sorts, but trust me, this book is a bonafide page turner. Kate plays first time pregnant lady to a T, full of concerns and angst when it comes to changing poopy diapers, and don’t even get her started on breastfeeding. How does that work, again? Lending comic relief is her extended family; a mother whose biggest concern is having an open bar at her anniversary party, sisters who get Kate’s goat and won’t let up, a father who sits idly by and watches the drama with a smile on his face. What you’ll discover, though, is an undercurrent of love. No matter how crazy they make each other, there is a whole lot of love. An added bonus: politics in the work place. No Kidding touches a bit on this, when referencing Kate’s pregnancy and how this pertains to her job security. Is that why her job is in danger? Can an employer let someone go due to familial status? Isn’t that illegal? Brace yourself for the stand-off between Kate and U.S. Water Works. Wittman has comedic timing. This shows not only in the story, but also in the way she’s written her characters. Kate says what’s on everyone’s mind (even if we are too afraid to admit to it). If you want a fun read, I suggest you give this book a try. 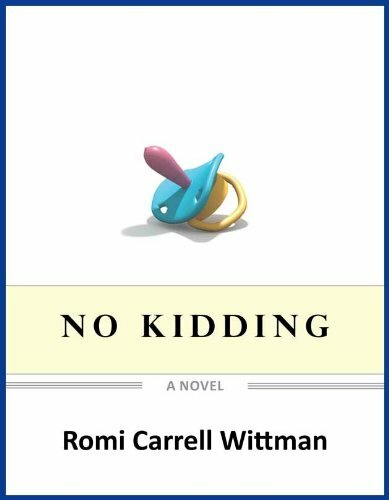 Thanks to Romi Carrell Wittman for the book in exchange for an honest review. THANK YOU for your awesome review! I'm thrilled you liked the book and hope others will, too! Sounds like a fun read...I'll add it to my TBR shelf! I just bought this because of your review, and Romi, I am so looking forward to reading it!